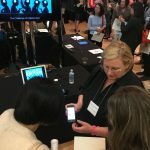 On Oct. 2, San Jose State University faculty, staff and students joined colleagues from Stanford University, University of California, Berkeley, UC San Francisco, University of San Francisco, San Francisco State University, Santa Clara University and Saint Mary’s College of California at the Academic Technology Expo. 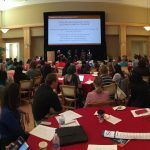 The event provided a forum to share, discuss and promote effective practices for teaching and learning with technology. The Expo included a series of IdeaLab sessions and a student panel. 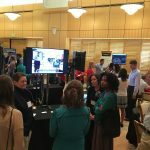 The IdeaLab is a unique interactive session where presenters showcase practices, projects and technologies that are improving teaching and learning at participating institutions. Each presentation focused on a central teaching and learning challenge and how their solution might be adopted by other participants. IdeaLab sessions included topics such as virtual reality, open education resources, writing activities, and student-centered approaches to communication, metacognition, and assessment that are enhanced by technology with eight teams of SJSU affiliates presenting throughout the day. Go OER… The New Mantra! Additionally, Alora Frederick, Marketing ’18 with a minor in advertising, joined students from other participating campuses on a student panel. The discussion focused on teaching methods and tools used in courses. The panel provided an opportunity for students to share their experiences, thoughts and opinions on using different methods and tools. For additional information about the event, visit the ATXpo website. For questions or for those interested in participating next year, please contact Jennifer Redd. 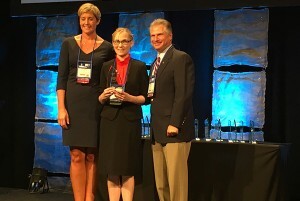 Jennifer Redd, the director of eCampus, center, receives the OLC Award for Excellence in Faculty Development for Online Teaching. The Online Learning Consortium (OLC), a professional organization devoted to advancing the quality of online learning worldwide, selected San Jose State University to receive the 2016 OLC Award for Excellence in Faculty Development for Online Teaching. Director of SJSU’s eCampus Jennifer Redd accepted the award for SJSU at the OLC Accelerate 2016 Conference in Orlando, Florida, on Nov. 19. Faculty development for online teaching is supported across the university by the eCampus Department. eCampus serves the entire SJSU community to advance the effective use of current and emerging technologies, to cultivate excellence in teaching, and to foster significant student learning. The implementation of a successful faculty development program involves collaboration among departments on campus to address the needs and goals of their online courses and programs. 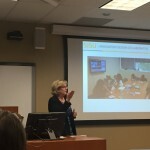 During 2015-16, Director of eCampus Jennifer Redd said she and her staff members offered more than 100 workshops with 500 faculty and staff registered to participate in person or online. In addition to helping with the development of online courses, eCampus provides training on a variety of software tools available to the campus. A full list of upcoming workshops is available online. The university was selected for the OLC Award based on the following criteria: effectiveness in helping faculty develop and teach a large number of high-quality online courses; scope of impact within the institution; maintaining a high level of faculty satisfaction as judged by surveys and participation rates; and letters of support from faculty who participated in the workshops. In 2014, OLC recognized SJSU’s School of Information, in the College of Applied Sciences and Arts, for its fully online graduate programs. 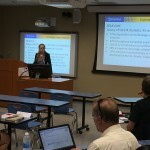 The faculty in the School of Information provide the T3 Series (Teaching Tips and Techniques) to provide support to faculty in other disciplines who are interested in engaging with online tools. Also at the conference, SJSU eCampus Instructional Designer Yingjie Liu presented at the conference. Her presentation was about the use of templates to scaffold the course design process for instructors. San Jose State University’s eCampus is offering three upcoming workshops that will help faculty members support faculty and student success. I have an iPad. Now What? December 9, 10:00 a.m. – 11:30 a.m.
During this session, faculty members will lead a discussion regarding how iPads are used in their courses. They will share specific examples related to the pedagogies implemented. Next, Apple Representatives will share best practices/tips when incorporating iPads into the curriculum. Finally, we will think about next steps and encourage attendees to reflect upon their own courses. Refreshments will be provided. If interested in attending, please complete the iPad Workshop Registration Form. December 12, 12:00 p.m. – 1:30 p.m.
Are you familiar with the SJSU adopted writing handbook, Writer’s Help? Have you noticed the link in your Canvas course? Please join us at this upcoming informational session where we will take a deep dive into Writer’s Help to show the features and benefits for both you and your students. We will also explore how you can customize and personalize Writer’s Help to incorporate content, assessment, and the LearningCurve feature. Additionally, faculty will have the opportunity to share their experiences. Lunch will be provided. Please reserve your spot by registering for the Writer’s Help Luncheon. January 20 9:00 a.m. – 5:00 p.m.
Quality Matters developed a detailed, research-based rubric that specifies best practices for online/hybrid course design. We are offering an in-person one-day session on January 20 from 9:00 a.m. – 5:00 p.m. Through this training, participants will learn how to apply the Quality Matters Rubric Standards to a course, how to apply the concept of alignment to various course components, and how to provide helpful recommendations. Certificates will be available upon completion of the course. Lunch will be provided. If interested in participating, please complete the Quality Matters Workshop Registration Form. Jennifer Redd presents some statistics to faculty on use of technology in classrooms. Amna Jaffer shares how she uses technology in her classrooms. Colleen O’Leary-Kelley, center, presents on virtual reality with student Bryan Dang. 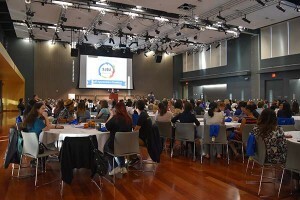 San Jose State professors who are interested in using new technology in a “next generation” classroom on campus gathered on May 17 to hear from colleagues who have already implemented innovative teaching methods in their courses. 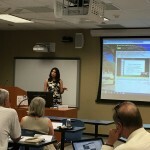 During the workshop, Academic Technology and ITS staff members, and faculty members discussed the technology usage landscape, connectedness, the digital divide and building learning pathways. Jennifer Redd, director of eCampus for Academic Technology, shared some statistics from an Educause survey that found 92 percent of college students own a smartphone while 91 percent own a laptop, making technology accessible in most classrooms. The survey found that three in five instructors use technology during class and encourage the use of collaborative tools. Faculty members shared some of the ways they have used collaborative tools in the classroom, including telepresence, lecture capture and learning management systems. San Jose State currently has seven “next generation” classrooms that include audio, visual and lecture capture equipment. The classrooms allow faculty members and students to interact with others remotely, record sessions to view online later and to collaborate through learning management systems such as Canvas. Mobile telepresence units, Wifi and Smartboards allow some of the same tools to be used in other classrooms on campus. Academic Technology staff members are available to support faculty who are interested in implementing teaching techniques that use technology to enhance student engagement and learning in their classrooms. See a schedule of upcoming workshops online. Amy D’Anna, a marketing coordinator with the College of International and Extended Studies, was excited to learn about the Staff Professional Grant program via an email sent out early this semester from the Provost Office. She is one of 48 individuals and groups of staff members who successfully applied for a grant offered this fall through the Academic Affairs Division priority group on RSCA and professional development. Individuals were allowed to apply for up to $1,500, with groups eligible to apply for $5,000. A second call for Academic Affairs Staff Professional Development Grant proposals has been announced. Staff members will have until Nov. 13 to submit an application and will be notified in December if their application was successful. See the full list of awardees from the first round of funding. “This will help by adding formal education to my applied experience in the field of marketing and PR,” D’Anna said. She said the courses she takes have allowed her to keep current and gain exposure to crucial developments in cultural communications, social media, technological advances and more. D’Anna said she appreciates that the provost understands staff members are an integral part of SJSU and deserve professional growth. Recipients of the Staff Professional Development Grant were recognized in the program at the Academic Affairs Division Staff Appreciation Breakfast in October. Mark Adams, the project director for the Pakistan Distance Education Enhancement Program (PDEEP) and an instructional developer with the eCampus group in Academic Technology, is planning to use his grant to take a course called “Managing without Authority” at Stanford University. “The course focus is on how to influence and persuade others, build and maintain effective working relationships and get things done in a diverse, global environment,” he said. The course will support his work on the PDEEP grant as he helps to develop an eCampus infrastructure for Allama Iqbal Open University in Pakistan as well as in working with faculty members at SJSU to share the benefits of online tools. Lauren Andersen, a financial analyst in the University Library, will use her grant to attend the CSU Academic Resource Conference.